The scene was set at Wembley Stadium in London, Sunday September 28th. Perhaps the most important game of this young season for the Miami Dolphins. It was an important game no doubt. The Dolphins were not in must win territory but a win(or loss) here could go a long way in determining how the rest of the season would go. Quarterback Ryan Tannehill had struggled early in the season with the new offense and head coach Joe Philbin did no one any favors by refusing to name his starting quarterback early in the week. Things were on edge, something had to give. Win this game and the team can move forward, lose it and it could be a train wreck. Thankfully the team came together across the pond. They dominated. The defense intercepted their first three passes of the season, while also returning a fumble for a touchdown. The running game came alive rushing for 157 yards. And the much-maligned quarterback? Ryan Tannehill played his best game of the season. He played confident, decisive. 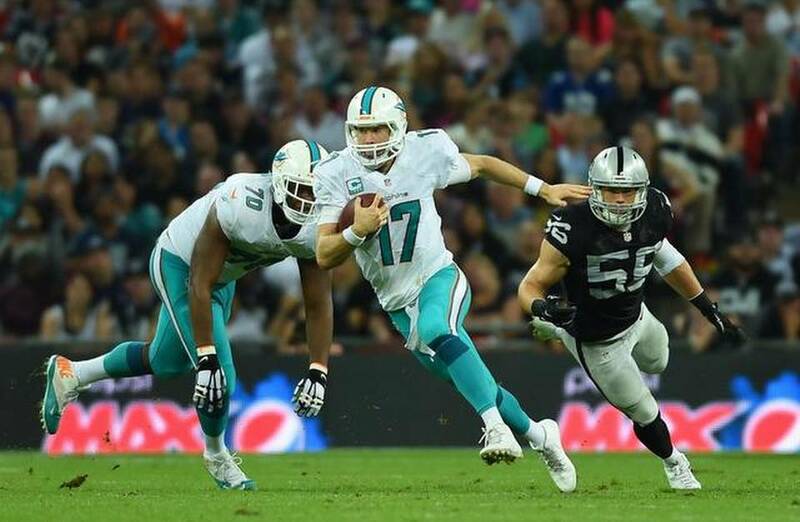 Tannehill threw for 278 yards and two touchdowns, he added another 35 yards on the ground. This was the full-team performance many had been waiting for. Time to exhale, all was right with the Dolphins world. The Oakland Raiders are still members of the National Football League, right? Yes they are. The truth is you play the team in front of you. That is all. 16-0 or 0-16 you play the team in front of you. These players are the top 1% of all football players on the planet. No game is given to you. Everything is earned. We do not get to choose which games we count and which we don’t. Yes some teams are clearly better than others, but that changes from week to week. You play the team in front of you. Now it is time to build upon that. Previous Post Wheels falling off. Next Post Patriots not quite done.